First Haircuts at Harmony Barber - Pixie & Pirate Destinations *|* Wishes become memories. One dream at a time. 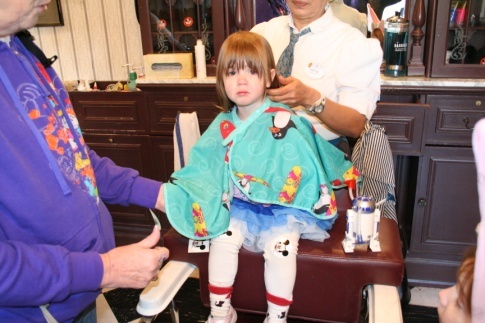 The first hair cut can be something that is both exciting and scary for kids and their parents. 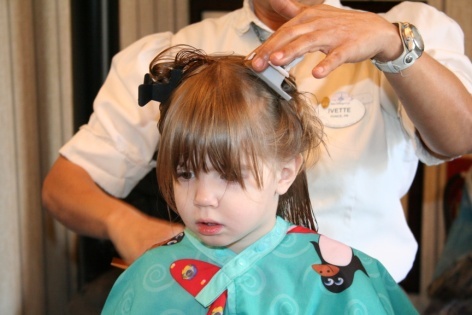 Getting the first hair cut at the Walt Disney World® Resort can make this milestone even more magical. We started planning my youngest twins’ first trip to Walt Disney World right after they turned 2 years old. I wanted to make this trip memorable for both them and for me. They were too young to go with their big sisters to the Bibbidi Bobbidi Boutique, however there was another option. The Harmony Barber Shop on Main Street is a full service barber shop. They have a special first haircut package, which was perfect since they had not had a first haircut yet. 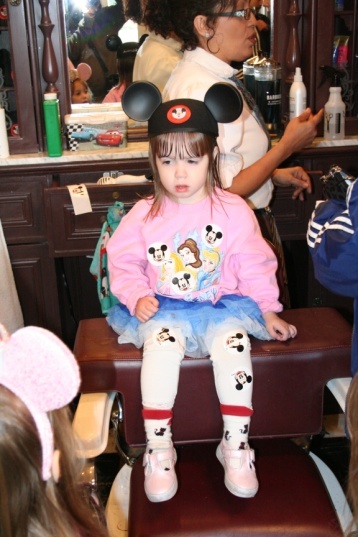 For a reasonable price (ask your DVP for an updated price) your child gets their 1st hair cut, a certificate of bravery, mouse ears and a touch of magic. I made an appointment before we left for our trip. You can walk in, but I highly recommend getting an appointment since you don’t want to waste time when you are at WDW. We walked in and since we had the 1st appointment of the day, the kids were seen right away. 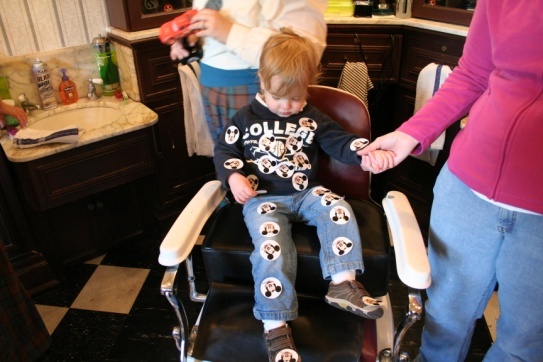 Once in the barber seat Jacob’s stylist Barbara immediately covered him with Mickey stickers. At first I thought this was just a fun distraction but I found out later the stickers had a purpose. Lily was a little upset when they put the cape around her, but she got some Mickey stickers and some bubbles to help her feel better. Both stylists were very friendly and had lots of tricks to make unhappy customers feel better. They both asked what I wanted done and how I wanted their hair to look. _Within a few moments my babies turned into toddlers. It’s amazing how grown up they looked after their 1st haircut. At the end of Jacob’s hair cut, Barbara and I had a race to see who could pick up the most hair off of Jacob’s clothes with the stickers she had put all over him earlier. See, I told you there was a reason for the stickers! After taking a look at their new haircuts in a mirror both kids got new mouse ears with the words “First Hair Cut” stitched on the back. They got nice certificates of bravery with their names and the date. The stylists wrapped up pieces of their hair to take home and put in their baby books. Unlike Jacob, Lily wore her mouse ears all day. When we met Ariel and Prince Eric later that day, Eric remarked that “First Hair Cut” was a very strange name. My older girls got a laugh out of this and explained that her name was Lily and she had just had her first hair cut. He then said that she looked very cute with her new haircut. Overall it was a very positive experience for both me and the kids. I’m so glad that we got to experience this milestone at the Magic Kingdom. It made it even more special. If you are too old for a first haircut but would like to get a good haircut with a touch of magic, the Harmony Barber Shop is able to help. The Harmony Barber Shop is also a cheaper option if you want to get your princess’s hair done but don’t want to pay for BBB. They can cut and style her hair with colored hair gel (it washes out) and pixie dust. I would highly recommend getting a hair cut at the Harmony Barber Shop to anyone. Ask your DVP to help you make an appointment today. 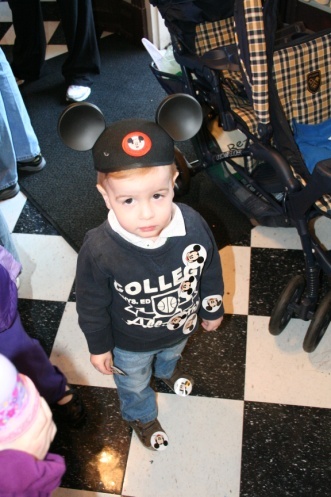 Let your child earn their "First Hair Cut" ears - Request your Walt Disney World Resort quote today!